Most of Us Like Playing Games Using Our Android Device When Doing Nothing With Our Android, we all Know That is not all the time we use our phone to Browse & chat. Sometimes we use Our phone For Fun when doing nothing. Now a days mostly the games that Come with High graphics & Great Playing Experience Are Installed Separately Apk & obb. Once you are done with Any One Above Tool, you are to Download One Tool for the file extractor, the next thing will be to download any game Apk with obb. *.First of open the folder where you have downloaded the Apk with obb. *.Now copy Apk and obb files to obb folder. *.Once you are in obb Folder paste Apk and Obb files. *.Now rename obb file and copy the name of obb file. *.Now create a newfolder in obb folder and paste the same name you copied before. *.Now transfer Apk and obb to that new Folder. *.Now simply Click on Apk and Install the Game. *.You Are done, enjoy the game.If you don,t under stand this method simply follow this method and i personally recommend this method to all beginners. *.First go to the folder where you have downloaded the game Apk and obb. *.Simply click on Apk and install the Game. *.Once the is installed simply open the game. *.It will start to download the obb file, but now simply close the game. *.once this is done, simply go to Storage<< sd card<< Android<< data. *.In data Folder you will see a Folder for the Newly installed Game. *.Simply rename the folder and copy the name of folder. *.Now go to Storage<< sd card<< Android<< obb and create a new folder and name the folder with the same name you copied before. *.Now copy the obb file to this new Folder and your are done. *.Enjoy the game. 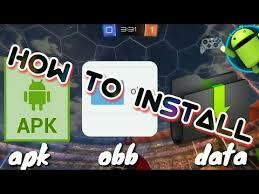 now you know how to install apk with obb, and if you like my simply method, Please Kindly Share this Posts with Others. Having Any Question? or Help? We Have A Comment Box Below For You To Ask Any question About This Blog Posts And Admin is Welcome To Answer Your Questions. Please Always Do Share Our Post With Others.